Investing Advice And InformationEconomic NewsShould We Honor Adam Smith or Karl Marx? On Monday, September 24, I was invited to give the first Adam Smith lecture at the Panmure House, the last home lived in by the founder of modern economics. The house is located in Edinburgh, Scotland, and recently has been refurbished by the Edinburgh School of Business. 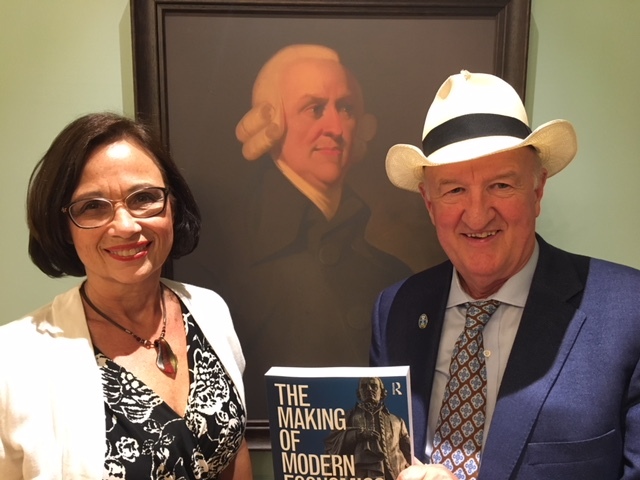 Jo Ann and Mark Skousen stand in front of the Adam Smith portrait at the Panmure House, Edinburgh, Scotland. I was introduced by Professor Keith Lumsden, who has been spearheading the effort to create a new home for Adam Smith and his ideas. My topic was my book “The Making of Modern Economics,” which now is in its 3rd edition and published by Routledge. Adam Smith is the hero of the book, and all economists are judged whether they support his “system of natural liberty” or oppose it. The book is very popular and has been endorsed by Milton Friedman, Steve Forbes, John Mackey (who has read it three times) and many other economists and business leaders. You can read Mr. Forbes’s full remarks here: http://mskousen.com/2018/07/steve-forbes-remarks-on-economics-triple-crown-to-mark-skousen/. Amazon charges $49.99 (no discount) for “The Making of Modern Economics,” but you can get it for only $35 postpaid if you order through Ensign Publishing. Call Harold at 1-866-254-2057. All copies will be autographed by me. Who’s More Popular, Adam Smith or Karl Marx? While at this event, several people noted that thousands more people visit the birthplace and gravesites of Karl Marx than they did for Adam Smith. And it’s not just because it’s the 200th anniversary of Karl Marx’s birth. I think it’s the same reason Dante’s Inferno is read more than Dante’s Paradise: People are more enamored with evil than good. Countries that have adopted the Adam Smith model have advanced much more than those who have adopted the Karl Marx model. Chapter 6 of “The Making of Modern Economics” has a devastating chapter on Karl Marx. I don’t pull any punches. It’s entitled, “Marx Madness Plunges Economics into a New Dark Age.” One student from the University of the Philippines (a hotbed of Marxism) copied the entire chapter in an email and sent it to all his fellow students and professors. It made a huge difference. Recently, my book, “The Big Three in Economics” ( smaller version of “The Making of Modern Economics”) was translated into Arabic. 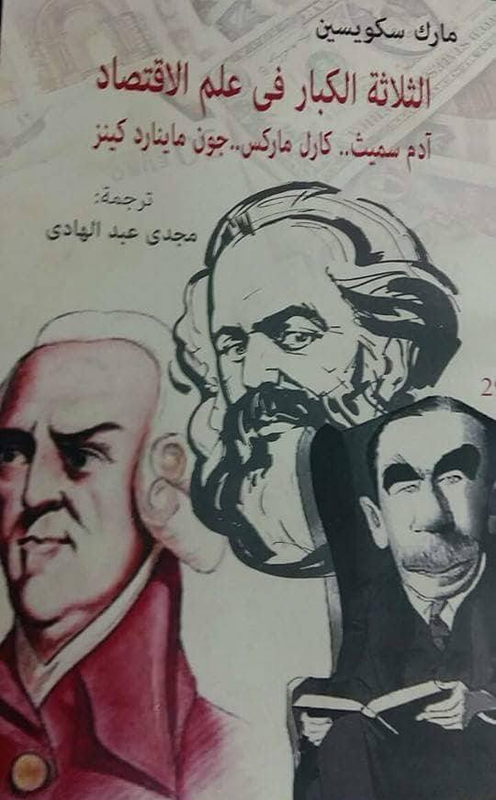 The cover designer made Marx bigger than Smith or Keynes, but if he had read the book, he would know that Smith is the dominant economic thinker of our age. This will be a small private conference with no more than 40 individuals. We’ve already sold 12 cabins. Please call Nicole at the MoneyShow (who is organizing the cruise for us), toll-free, at 1-844-225-5838 for a free color brochure and to make a deposit. Cabins are available as little as $2,399 per person/double occupancy. But they won’t last. Call today. The Fraser Institute just released its latest Economic Freedom Index (see www.freetheworld.com). The good news is that the United States is making a dramatic comeback and is now ranked #6. Last year, it was tied with Canada at #11. Lower taxes and deregulation are working their magic. The bad news is that Venezuela comes in dead last, #162, as the least free country in the list of countries covered by the Fraser Institute (North Korea is not listed because of lack of data). The sad thing is that Venezuela was listed as the #10 most free country in the world in 1970. But it gradually was taken over by radical Marxists, led by Hugo Chavez, who took over as president in 1999. In less than 20 years, the country has collapsed into poverty and starvation, even though it has the largest oil reserves in the world, ahead of Saudi Arabia. Plus, Venezuela’s oil production has fallen to its lowest level since 1947. According to Steve Hanke, Venezuela now produces less oil than North Dakota. According to the Economist, there is no relief in sight. Chavez and his successor, Maduro, have purged the opposition in the military, and it looks like Venezuela is going the way of Cuba. Is anyone listening? Why don’t Fox News and CNN cover this travesty? Investing expert Jim Woods explains how "doing less" can actually help top performers be more productive.